Elegant Baby Bath Squirties: These are by far the bath toy with the best squirt! They are easy to squeeze, so Liam is always squirting water all over Conor during bath time. There are so many adorable sets to choose from; however, the hero set is perfect for your baby boy! Melissa & Dough Pounding Bench: Liam absolutely goes to town on this thing! At first he was a little rough with the hammer in general, but now he knows exactly what to do with it and even takes turns using it with me! I love wooden toys, and this one is great quality! Janod Multi Car Truck: This brand makes the most beautiful wooden toys; I want everything they have! Liam loves playing with the little cars as well as trying to pull the whole truck around. I'm excited about all the imaginative play that this truck will bring as Liam starts talking more & more. Little Mr. Bowtie: I won this bowtie in a giveaway and am absolutely obsessed with it! I'm already stalking the new prints and trying to decide what I want to buy for Fall as well as the holidays! The bowtie attaches to the top button on a shirt, so you don't have to worry about it going around your little ones neck. Absolute genius! If you're looking to purchase one, I highly suggest following littlemrties on Instagram because they are frequently posting sales! Fisher Price Bubble Mower: This toy originally belonged to our neighbors, but Liam has taken it over and somehow it found its way into our house! Liam loves pushing the mower around outside or inside, all times during the day. Sometimes he wakes up and goes right for it! Little L doesn't even know that it can blow bubbles yet... I haven't hooked up a bottle to it, but I'm sure his world will be rocked whenever I get around to it. 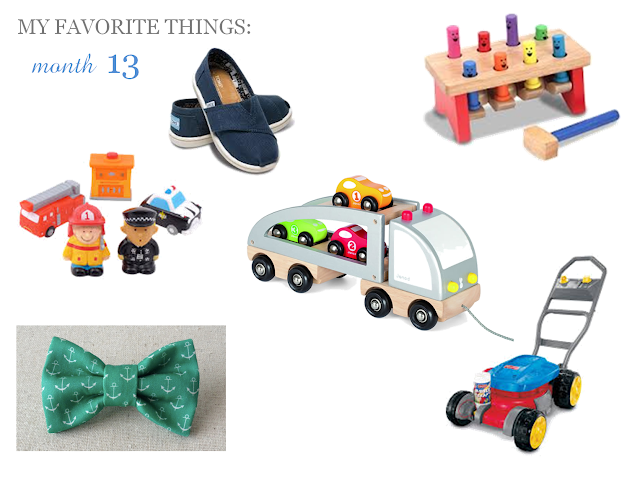 Tiny Toms: Liam is about to outgrow his Sperry's, so this is our new shoe of choice! I love how they look on little boys, although they make Liam look much more like a toddler than a baby....I can't handle it! I have to admit that these shoes tend to fall off a lot, but little L may still be growing into them. Either way, I don't really care because they are just too darn cute! the Melissa and Doug pounding bench looks fun! Our youngest is 18 months old and would love that. Anything that can make noise or get beat up is a plus for her LOL. With having 3 (4 in Dec) little girls, I've always seen the bubble lawn mowers but never purchased one. Great idea for next Spring because it can fit so many ages and bubbles are fun for everyone! I loved most of these as well around that age. Good choices! That little bow-tie is ridiculous. I love it. They are about the cutest thing ever! I want an entire collection of bow ties! And we have the bubble lawn mower too!! altho we have like 3 lawn mowers. lol the bubble one stays outside, we have one inside and then we brought one to my parents!